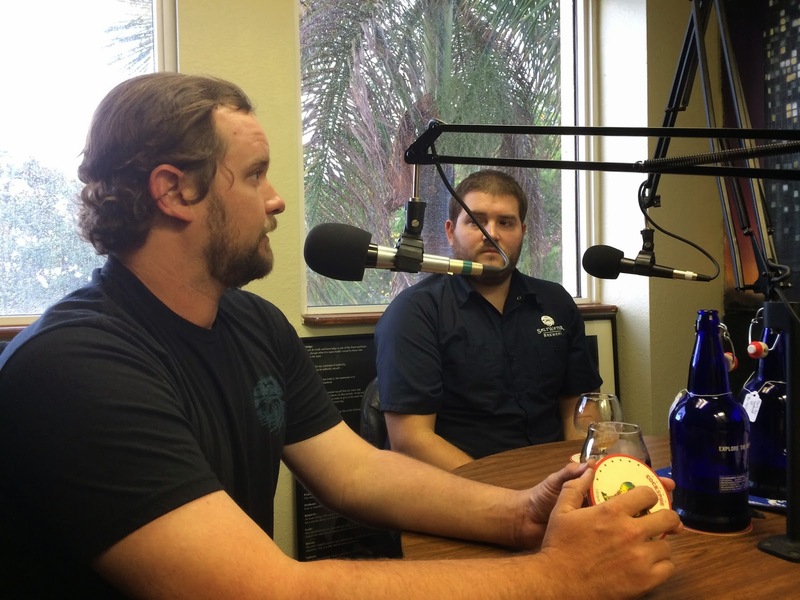 Last night's ByTheGlassShow featured Saltwater Brewery which opened less than a year ago in Delray Beach, Florida. We were excited to check out another local brewery and their beers. First of all, Julie Durda, what is up with the wicked weather that descends upon the Hollywood studio from 5-6 pm every Thursday night? Yep, co-founders Dustin Jeffers and Pete Agardy arrived just as the show began amidst rain and wind violently whipping through the area. Saltwater Brewery is located just off I-95 at Atlantic Avenue in Delray Beach. The brewery occupies a historic barn that is visible from the highway. Dustin, Pete and their team redesigned the barn to fit their needs, creating a 20bbl production brewery in addition to an inviting tasting room and education center. Pete used his fine art background and painted murals inside and out to create a welcoming place for locals to stop by and have a few beers. And from what they said, the place has been busy! For now, Saltwater is focusing on the local area, servicing a handful of restaurants with their core beers. And they are having trouble keeping up (which isn't a bad problem to have). In less than a year, they already have brewed 17 beers, though they make sure they always have their base 5 in the rotation. So that's when we all got antsy and asked to check one out. First up, Lager Del Ray, yes spelled like that, meaning Lager of the King! This is a 3.5% light lager brewed with rice to enhance the flavor. Again, yes, you heard that right. Read the name again and add it to rice and figure out which big boy this is a stab at. Anyway, this was clean and fresh and refreshing and had a unique flavor from the rice. We moved on to Sea Cow Milk Stout, named by Pete's wife after the Florida Manatee. This is one of their core beers that will be in distribution locally. Creamy, chocolaty, really smooth and not too sweet. Great flavors. Everything you want in a beer. 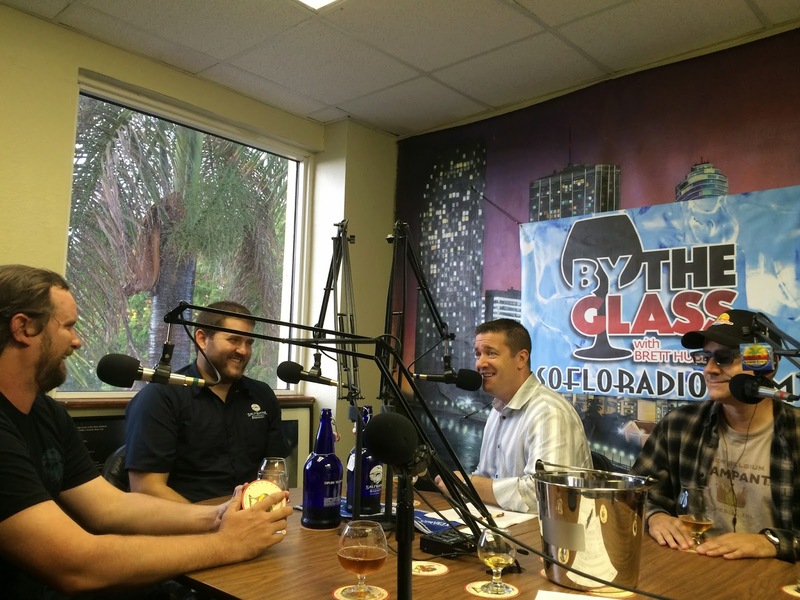 Dustin explained that it's important to them to brew great base beers first, so their customers know what happens when they make a twist on them. For example, if they barrel age a particular beer or add another ingredient like coffee. We then tried two beers from Saltwater's Bermuda Triangle Series, often named for expressions used by one of their partners during construction of the brewery (and still to this day). Don't Get Confused is an 11% alcohol Belgian Tripel. I think someone booed them when they said Belgium (considering the US loss on Tuesday), but that lasted exactly half a second. Great orange and citrus flavors, nicely sweet from the candi sugar, but not overdone and still enough hop balance to make a tasty beer. There is a Bourbon Barrel version as well that I'll need to check out sometime. 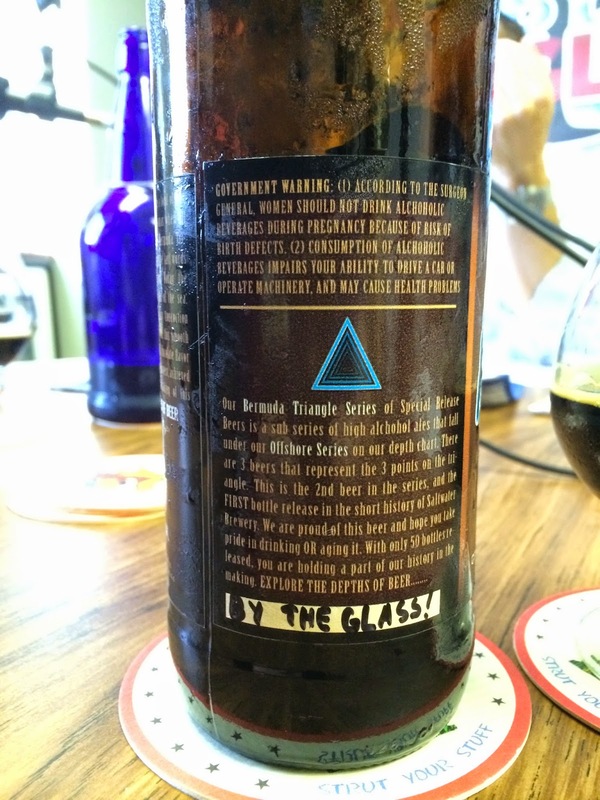 As we tried the next Bermuda Triangle Series beer, we asked about the future of their distribution. Right now, their beers are only available in kegs and growlers at the brewery. 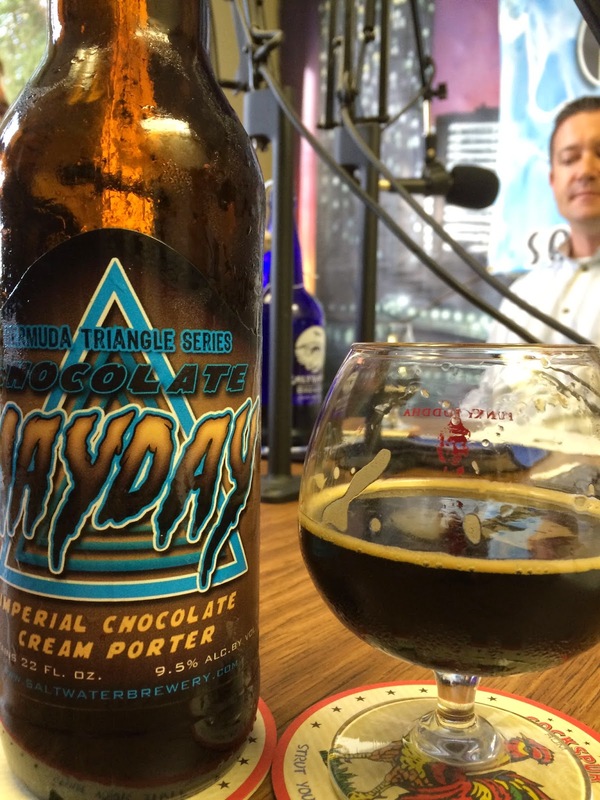 But the bomber bottle of Chocolate MayDay Imperial Chocolate Porter said differently! 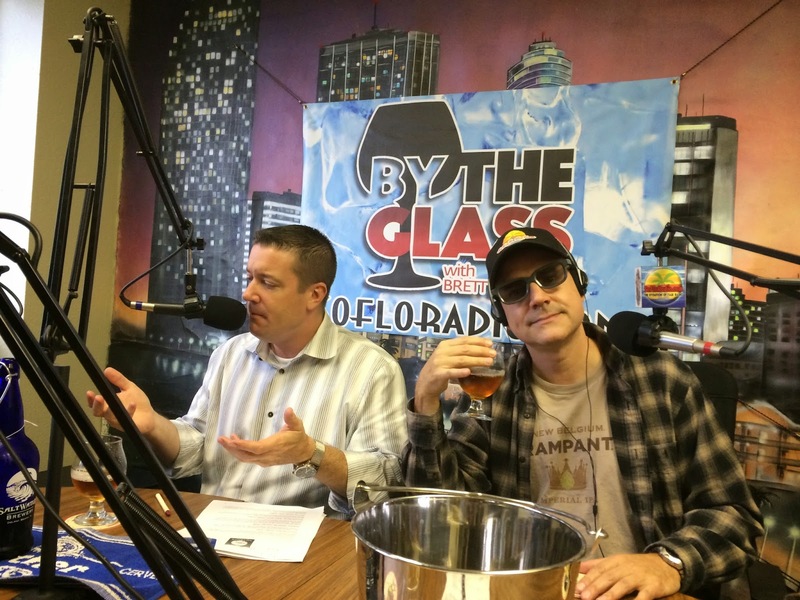 Dustin and Pete let us know that they are speaking with some other local breweries and getting advice from them about what route they should take. They are considering canning and bottling or some combination of the two, perhaps just bottling limited release bombers from time to time. (Pete said "Bottle Labelers Wanted!") Chocolate MayDay was awesome. Rich, big chocolate flavors (only because of the malt), creamy with a nice sweetness. Most of Saltwater's beers are simple recipes though they do have a few projects that push the limits. I already mentioned their barrel aging interest. They have found that this project is sustainable as the temperatures in Florida shorten the needed aging time considerably. Saltwater is brewing some wild ales made with yeast harvested outside their barn--very interesting. They said the yeast imparts a starfruit quality to the beer. Gluten-free sorghum beer? Yep! And two fruit beers, too. 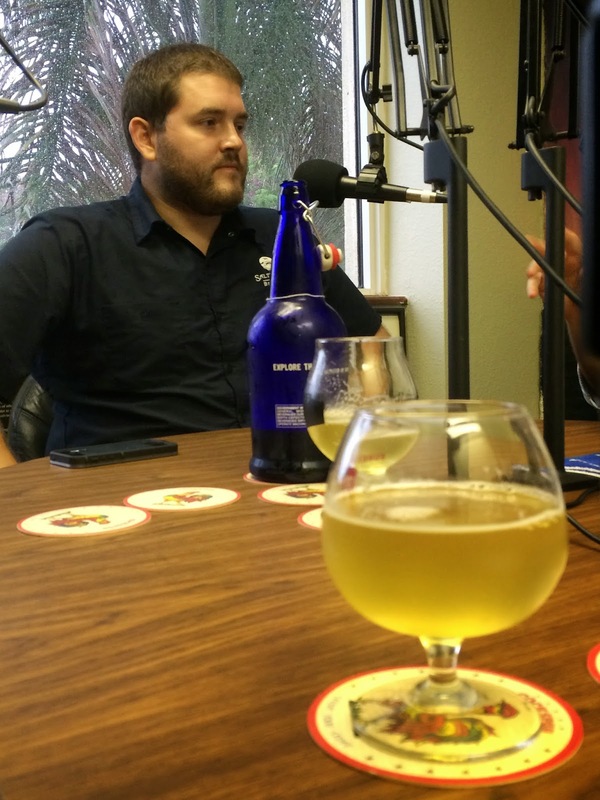 Pete also said that they use a lot of seagrape wood and are really impressed with how well it works with their beers. Brett asked him where they got that product and Pete said "he knows a landscape guy". LOL. Apparently Pete has a lot of connections locally as his family has long-standing roots in Florida. But basically, Saltwater salvages this wood and reuses it in the brewing process. We finished the evening with another core beer, Screamin Reels IPA. This is an East Coast/West Coast hybrid brewed with Columbus and Simcoe Clone experimental hops. Jorge happily noted that this was the first IPA of the day as well. Dustin said that they enjoy making many different styles of beer and are not going to have tons of IPA variations. Screamin Reels was nicely balanced, leaning bitter, and very fresh. They said they purposely served this beer last to balance out the other four beers that leaned sweet on average. If you're in the Delray Beach area, they are opened all weekend during regular hours. The tasting room has TVs and will be tuned in to the soccer games today! Check them out for sure and be sure to say hello to Dustin and Pete.